This Practical Guide seeks to illuminate the National Standards of Excellence for Headteachers, presenting a range of perspectives to bring the text alive for current and future school leaders and for those with the vital responsibilities of proper governance. Discounts available for multiple copies. Please email booksales@johncatt.com to enquire. Part Two of the book comprises the official Standards published by the DfE, by way of handy reference. Part Three contains some short essays by great school leaders. 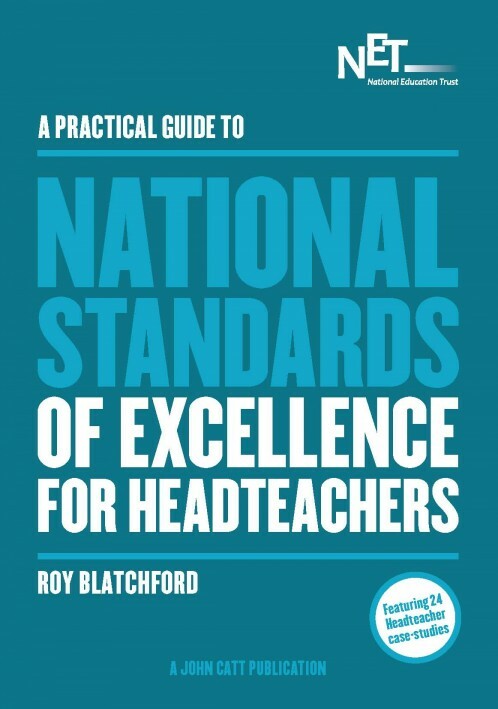 "Roy Blatchford has produced a typically readable and accessible guide which should be a ‘must’ for practising heads, those aspiring to the role, and for school governors. The book informs, challenges and provokes and will develop your understanding of headship in a way few authors manage." "The author brings his characteristic enthusiasm for schools and classrooms to illuminate the new Standards. This is essential reading for all emerging and existing Headteachers or Executive Headteachers, highlighting the challenges of educational and moral leadership in the 21st century." "Another commendable resource from Roy Blatchford. This book gives many practical suggestions, points of reflection, clear guidance and wisdom on which school leaders can draw. It provides a rock on which to stand amongst the ever shifting sands of time, policy and government changes. A book of good sense and direction, and wise advice delivered with good humour." "This Guide brilliantly articulates excellence in headship. As good for encouraging tentative, aspiring heads as for restoring vitality in the more experienced. His passion for the profession is infectious, and dipping into this book for 10 minutes is a sabbatical in an armchair."